Take a virtual trip to the great outdoors in Fortunes of the Fox, a camping themed slot powered by Playtech. It’s a 5 reel, 25 payline video slot that comes with a pick me round as well as a free spins feature that awards a minimum of 15 free spins with all payouts trebled. Head to the country from between 25p and £2,500 per spin. The visuals in Fortunes of the Fox are done cartoon style and are set in a rural wilderness – joining the lower value A to 9 playing cards are a camping stove and a ragged looking tent as well as dog and a grizzly old camper. Landing 5 of him on a payline awards 5,000 coins. The fox of the title is the wild – it doesn’t offer any cash rewards but replaces all other symbols bar the scatter. When the wild fox lands on the middle 3 reels, it will also trigger the Bonfire Free Games feature and with it 15 free spins. All winning combinations that are hit during the feature will benefit from a 3x multiplier and will be trebled. You can trigger more free spins, in chunks of 15, by landing 3 wilds on the same spin during the feature – the number of free spins that can be won are infinite. The second feature is the Lucky Grapes Bonus feature which is triggered by the grapes symbol (the scatter). You’ll be taken to a new screen where Foxy will hop on a trampoline to collect bunches of grapes and in the process win cash prizes. Keep on picking until she gets stuck in the trampoline. Fortunes of the Fox is a relatively gentle affair, both in the way it looks and the way it plays – this isn’t an especially volatile game as the variance is in the low to medium range. The imagery is cute enough without being too schmaltzy and the soundtrack is insanely catchy. 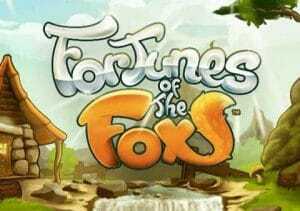 It all adds up to make Fortunes of the Fox an entertaining and very playable video slot. If you’re a city slicker looking for a slice of the great outdoors without the mud, rotten weather and interesting smells, then this virtual trip to the country should do the trick nicely. Playtech does offer much better games though with Buffalo Blitz a superb option.